Star Trek: Discovery season 2 premiere beams Captain Christopher Pike aboard to shake things up a bit. Our review tackles the strengths and promise of the new season. Not every cage is a prison. And not even “The Cage” can keep Pike out of the Trek Universe forever. Whether it was setting up the crux of season 2 (the seven signals scattered across space), building a familiar character from the ground up (Christopher Pike), or throwing caution to the wind (a red shirt DOESN’T die?! ), Star Trek: Discovery season 2 premiere is packed wall-to-wall with humor, heart, and no sign of lens flares. To set the season up, the Enterprise is down for the count after pursing on of seven distorted red signals scattered across space. The all-systems failures results in the two ships communicating via Morse code and eventually Pike and two officers, Connelly and Nhan, beaming aboard. I am the first to admit that the inclusion of Christopher Pike and the crew of the Enterprise was at first announcement, less than ideal. Sure, give us another heroic tale of the charismatic white man steering a Star Fleet ship to small victories. But Discovery’s inclusion of Pike is one of (overly) stressed equality. He’s here under orders and we better get used it. And you do. Quite easily, in fact. Because the other characters are not discounted by his presence, but rather their current struggles are reflected back in a new light. The crews aboard the Discovery and the Enterprise do not have such level footing. The Enterprise crew are back from a mission that kept them out of the war, unable to assist their brothers and sisters in Star Fleet. 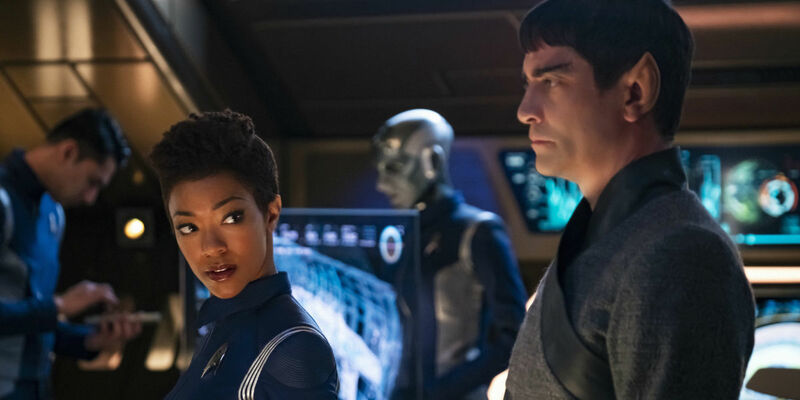 While the Discovery and its crew are coming to terms with incredible loss, distrust, and the impending idea that soon they will once again have to place their trust in a new captain. The premiere at first sets the two sides at odds. First, look at the captain in bright yellow, taking command of the chair. He’s got the (apparently) inheritable sharp tongue and cool gaze to win over even the toughest crew. Pike enters the ship with determination and an answer for everything. Next, pay attention to Saru. The noticeably frightened commander doing everything by order of Star Fleet to cling to some semblance of order. Citing regulations, refusing to bend the rules, Saru has his guard up following the betrayal of Lorca. He performs his duties to the letter that may seem like it creates a barrier between himself and Pike, but instead it draws a line in the sand. Saru’s just not ready to step over it for him just yet. Then there is the familial divide. Spock was always going to be a huge part of season 2. However, unlike the title would have you believe, Saru, Sarek, and Burnham are not greeted by science officer Spock when the transmitter brings the crew aboard. Luckily, Discovery has a lot of room to work with, especially if they are hoping to stretch this storyline out over most of the season. And choosing to not show Spock, or at least a present day version of him, in “Brother” leaves a void that demands to be filled. By the time we meet Spock in The Original Series, he’s already completed a five-year mission with Pike as his guide, and now, has been with Jim Kirk for a while. He’s established in the universe and settled into his place within it. There’s some growth left for him, but this chapter of his life, and the years preceding, are ripe for exploration. The connection between Sarek and Michael in season 2 naturally paved the way for the sibling relationship to unfold in due time. But there is more to it as we see in “Brother.” Saru brought in Michael to their home to learn empathy. Not the empathy of a human mother, a child is blinded to their relationship and what they can learn from their parents. But a parent, in tis case Sarek, is also blinded to what happens to their children as relationship take on new meaning. An objective view of the father-son, mother-son, brother-sister dynamic might not have been Sarek’s strength, but he did observe. And, as he relays to Michael, he observed a failure to properly accommodate the siblings. The early days, depicted in flashbacks here, show Michael receiving the comfort and warmth that she needed from Amanda during her early days with the family. She leaned heavily into her human side with Amanda. And Spock took notice. But Spock and Michael were able to reach a point of understanding. Michael cites that it was her fault that the two had no longer stayed in contact. And yet, Sarek admits he has not spoken to his son in years. Vulcans are not exactly the helicopter parents of the universe. Sarek may not be completely in sync with the interworking of familial relationships, but he does notice that Michael is withholding information from him. She is leaning into memories of her past, finding comfort in Amanda’s stories, and reflecting on her past with Spock, searching for something. This comes to a head at the end of the episode when she discovers that Spock went after what feared him the most. He followed his human exercises (drawing to make the the fear tangible), but ultimately followed his logical instincts to track down and analyze what confounded him. But what do the red dots and the Red Angel mean? Well, that is a question for another episode. Heavier stuff aside as the episode settles in, so does the crew. There are those who are naturally pliable, eager to be back aboard a ship headed for new adventure. And those who are ready to make peace with a new future. Pike has no intention of overstaying his welcome aboard the Enterprise, although circumstances dictate otherwise. He and Saru will work out a “joint-custody” situation for Discovery, Tilly will use the magic of math to keep Stamets aboard, and Stamets will, in good time, hopefully find a reason to extend his Kasselian opera note aboard the ship for just a little bit longer. 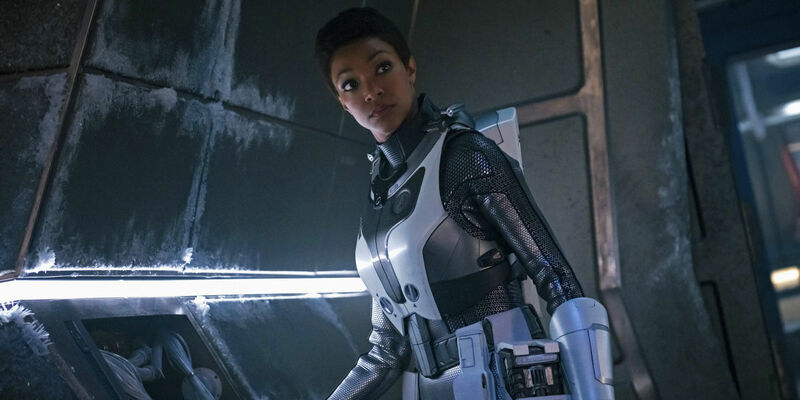 Star Trek: Discovery season 2 premiere also feeds into something else showrunner Alex Kurtzman has teased in the last few months. The episode are going to take on a more semi-episodic feel. If the continuation of the season plays out like “Brother” with a mission — in this case explore and retrieve any stranded survivors of the Hiawatha — and an unspooled thread for viewers to tug at to connect a greater story, then sign me up. Stamets appreciation of Kasselian opera and his battle with grief. While the second point is not a happy one, it is a healthy addition to the show. Stamets is taking time to process what happened to Hugh Culber and is taking steps to help himself. Saru’s threat ganglia making an appearance when Burnham is in trouble. Tilly being completely charmed and disarmed by Pike. GETTING THE NAMES OF THE CREW MEMBERS SAID ALOUD. Sad to report “hot guy on the bridge” from season 1 is nowhere in sight. RIP. Michael Burnham weaving a new mythology into the existing “Five Year Mission” opening. Sarek speaking about Amanda’s voice being a comfort to him. Every single line from Tilly. While hilarious, I hope she gets something a bit deeper now that she has this giant asteroid in the bay. Tilly is a genius, I want to see her “drunk with power” but also in action! Tig Notaro as the best engineer we will ever meet. She kept that crew alive, scienced the heck out of that ship, and still somehow had a sense of humor. MVP of the episode. The call out to “The Cage” in the form of the Talosian blood. Want more? Check out our list of questions we need answered in Star Trek: Discovery season 2! Star Trek: Discovery season 2, episode 2 airs Thursday, January 24 at 8:30 p.m. ET on CBS All Access and Friday, January 25 on Netflix.